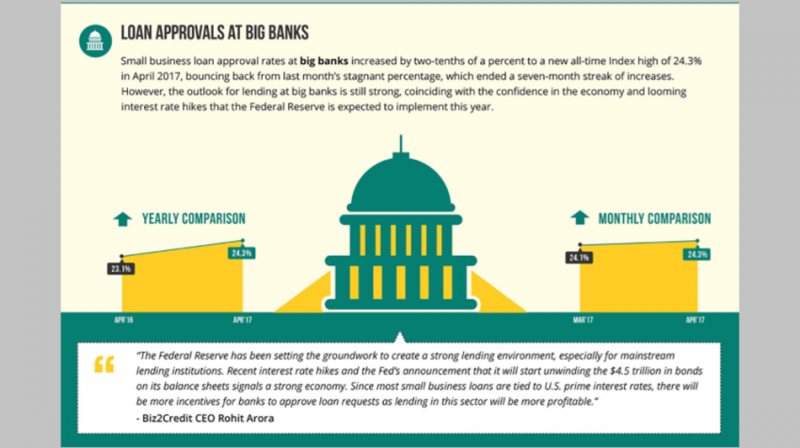 Loan approval rates at big banks rebounded after a setback month, the latest Biz2Credit Small Business Lending Index has revealed. 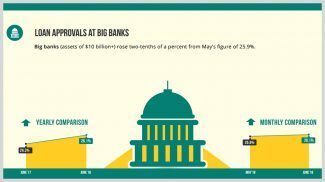 According to the newly published report, loan approval rates at big banks grew by two-tenths of a percent to a new all-time index high of 24.3 percent. This marked recovery from last month’s stagnant percentage, which ended a seven-month streak of increases. Meanwhile institutional lenders’ approval rates improved to 63.7 percent, reaching a new high on the index. On the other hand, alternative lenders saw approval rates dropping by three-tenths of a percent. In April, they approved 57.9 percent of loans requested. As for credit unions, approval rates declined one-tenth of a percent reaching 40.6 percent. This is the lowest lending rate to date in this category. Biz2Credit’s April 2017 edition of its report analyzes the results of more than 1,000 small business loan applications.